It’s easy to see why travellers and creative people from all over the world often find themselves marking San Cristobal de las Casas (San Cristobal) as one of their favourite places to visit in Mexico. 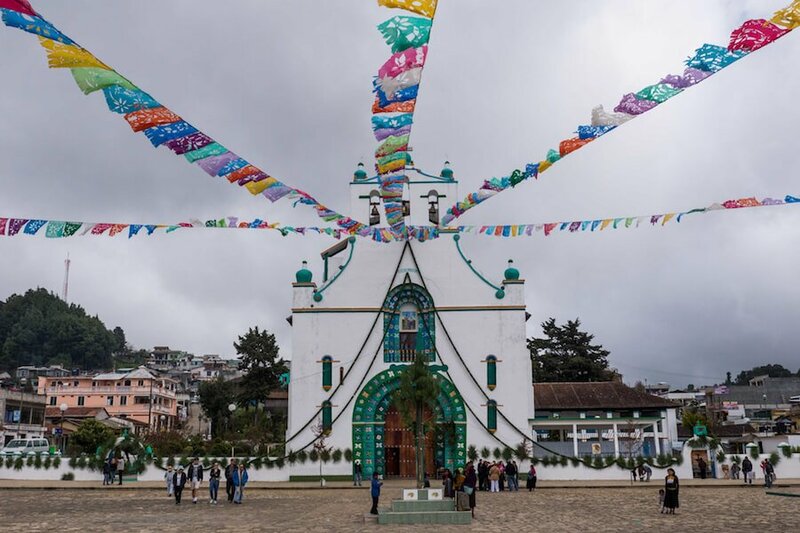 If you are looking for a cultural experience filled with art, tradition and colour, then there are so many amazing things to do in San Cristobal de las Casas that you’re going to find it hard to leave. 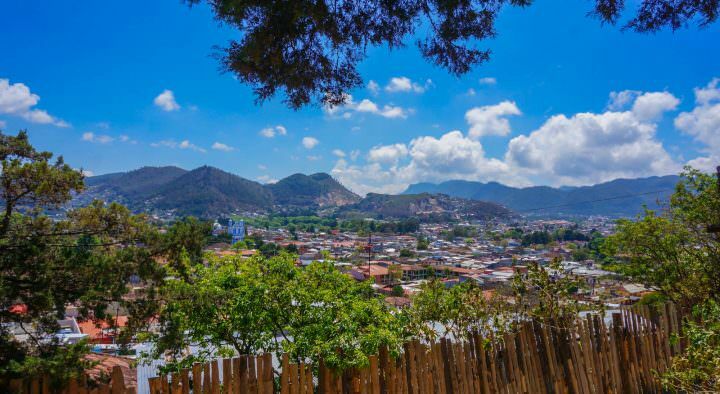 The first thing you’ll notice when you arrive in San Cristobal de las Casas is how European the city looks, with cobble-stone streets, wrought iron balconies and plant pots bursting from every piece of free space. But it also has that Mexican flair, with the houses all painted in bright cheerful colours. San Cristobal de las Casas is nestled inside a valley, 2200 meters above sea level. This means the days are usually cool and there is actually a “real” cold winter here. In fact, the nights can often get very cold, even in summer, so make sure you bring both warm and cool climate clothing with you. 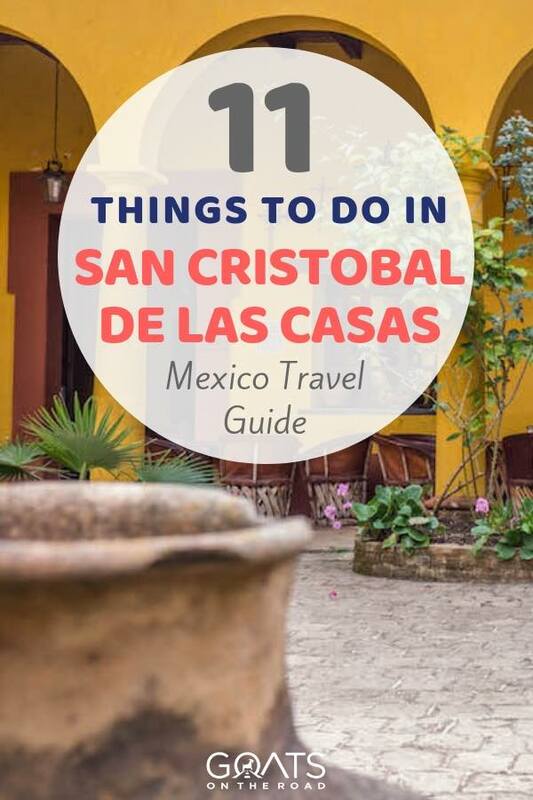 These are my best recommendations for things to do in San Cristobal de las Casas gained after visiting this incredible city twice in the last three years and not wanting to lave again after both of them! If you’re planning on travelling to Mexico, make sure this town is on your list. The free walking tour is my number one activity in San Cristobal de las Casas. The amount of mind-blowing information offered, hidden nooks and crannies to explore and friendly locals to meet are so worth the 3+ hours the walking tour takes to complete. Our tour took us through the vibrant and buzzing Artisan and Municipal Markets. Both of which I will talk about in more detail later. Afterwards, a bakery offered us complimentary freshly squeezed juices and locally grown organic coffee. During the tour were able to enter into two incredibly decorated churches, despite the extensive damage caused by the 2017 earthquake. Iglesia de Guadalupe has an incredible view of San Cristobal de las Casas, so be sure to climb to the roof! We finished the tour in a pox bar (pronounced posh). This alcoholic drink is kind of a local moonshine made only in this area from corn, sugar cane and wheat. The pox we had in this bar was easily the best we had in the whole of San Cristobal de las Casas. 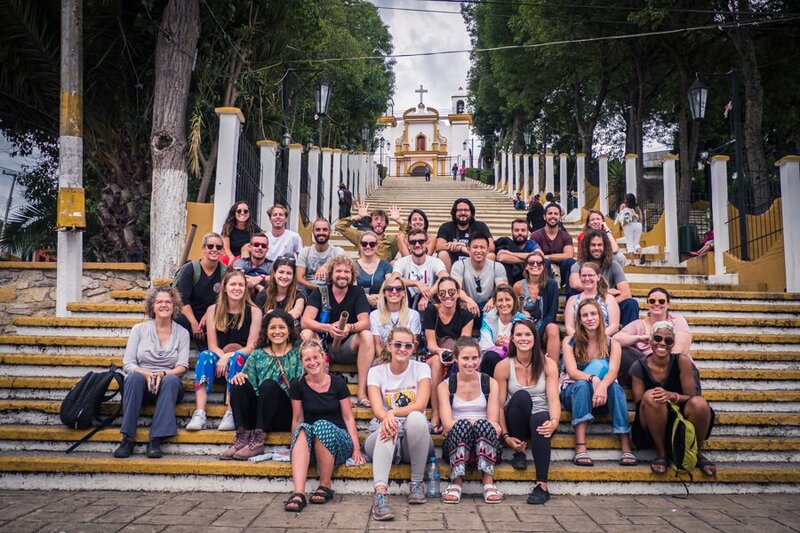 The Free Walking Tour is on the top for things this do in San Cristobal de las Casas. Paid for by donation only, the wealth of information I learnt about the city was really worth it. In fact, walking tours are one of the best things to do in Mexico as a whole. Whichever city you find yourself in, look for the free walking tours and don’t miss out. 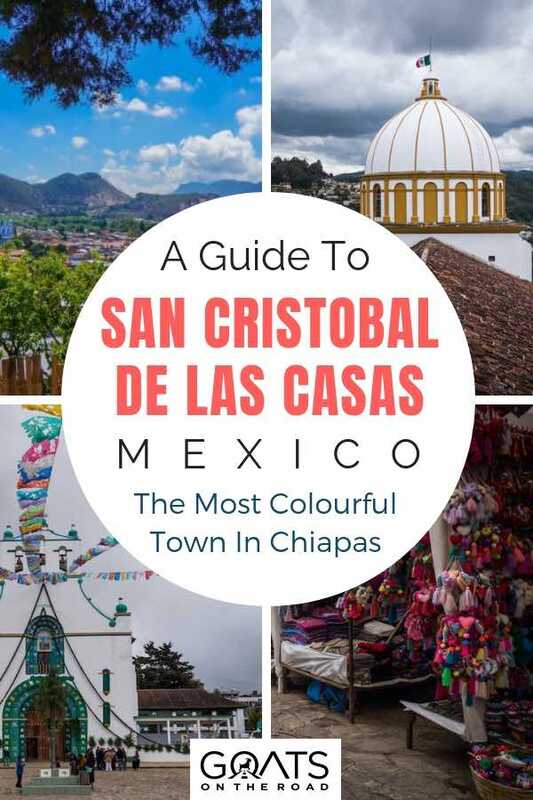 Visiting these two villages in San Cristobal de las Casas was one of the most confronting and mind-blowing experiences I have had travelling in a long, long time. You’ll make your way to the outskirts of San Cristobal de las Casas in the morning, passing by fields filled with greenhouses. 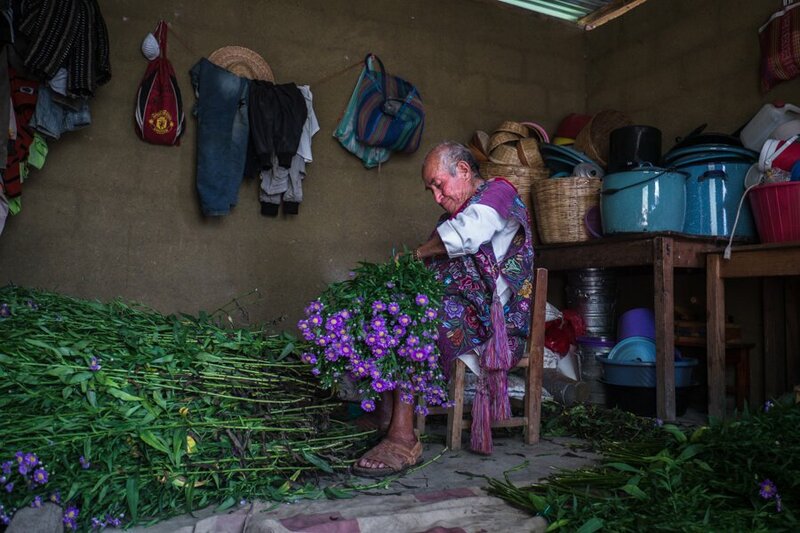 These are flower farms and there are hundreds of them, providing fresh, beautiful flowers to places all over Chiapas. In Zinacantan, visit the home of a local Indigenous textile-maker who makes the style of dress worn only by the local men and women in this area of Mexico. The intricately stitched, brightly coloured flowers adorning the dresses are a spectacle in themselves. I tried on a traditional dress and was offered (and drank) three different flavours of pox. You can also buy the textiles made by these people straight from their hands to yours. This is how I would recommend buying if you plan to, since it directly supports the Indigenous people who make them. Next, make sure you visit Iglesia de San Juan to have the most mind-blowing cultural experience! On the outside, the church looks like any other well-maintained church in Mexico, but once you step inside, everything changes. Inside, churchgoers sit on pine needles spread over the bare floors. Not a pew in sight here! Hundreds of thin intricately placed candles are usually arranged in front of them all burning at the same time. Glass boxes with well-cared-for statues of saints sit on tables, most with mirrors around their necks to deflect bad spirits. People will be chanting, or praying, and others chatting while music plays. People drink alcoholic pox and coca-cola while others smoke cigarettes. When I was there, a few groups of people appeared to have a shaman with them chanting, along with a live chicken in a plastic bag. During the ceremony inside the church, the chicken would be sacrificed and later cooked and made into a soup for the family to share. We later learnt that the carbonated drinks induced burping, which enabled bad spirits to exit the body and that the people would stay and finish their snacks and drinks before they were supposed to leave. Staying from a couple of hours to the entire day, just burping and praying. I highly recommend taking a tour to visit these two Indigenous communities. It is one of the most cultural things to do in San Cristobal de las Casas. Tours are approximately $300 pesos and can be booked at one of the many tour companies in San Cristobal. Alternatively, you can do a horse ride to San Juan Chamula (without visiting Zinacantan), which similarly takes about 3-4 hours and costs $300 pesos as well. Click here to learn more and to book this tour with Get Your Guide. 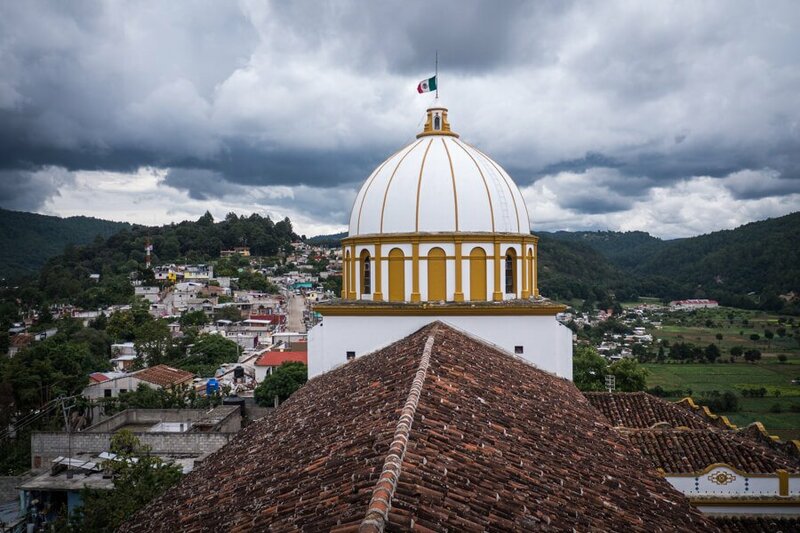 From almost anywhere in the old town area of San Cristobal de las Casas, you’ll be able to look up and see Iglesia de Guadalupe atop the hill. Make your way up the 80 steps to the church to see inside. Above the altar, a huge Guadalupe (Virgin Mary) statue sits framed in neon lights. The wild decorations are eccentric with big colourful bows on Jesus and the Saints. Visiting the church is free but you also have the option of climbing to the roof for an extra $5 pesos ($0.25) to peer back down on incredible 360-degree views of the city below. Though it does take a bit of gusto to squeeze through the small passage and past other climbers on your way up. This is one of the best things to do in San Cristobal de las Casas if you love a good viewpoint. Although these waterfalls weren’t originally on my list of things to do in San Cristobal de las Casas, I heard reports that this was one of the most beautiful places to visit in Mexico. The series of five waterfalls are found inside El Centro Ecoturístico Cadena de Cascadas, which is equivalent of a state park in the United States. The many viewpoints of the waterfalls are incredible with the main attraction being the largest waterfall formed by the San Vicente River, “Velo de Novia” (Bridal Veil). The trip to Cascadas El Chiflon and return to San Cristobal is a long day, but worth it. The tour costs around $35. Bring snacks and your swim-wear. Click here to learn more and to book this tour. **When backpacking Mexico, you’ll probably want to see more of the country than just San Cristobal de las Casas. For more information to help you plan, check out the things to do in Cabo San Lucas, the best things to do in Puerto Vallarta (a very fun city!) and the top things to do in La Paz. Casa Na Bolom (or House of the Jaguar in the local Tzotzil language) is one of the lesser-known places to visit in San Cristobal de las Casas – but it really shouldn’t be. The Museum is essentially the story behind Frans and Trudy Blom; two exceptionally interesting explorers who spent their lives protecting the culture and heritage of the surrounding Mayan regions. The couple spent over fifty years in Chiapas collecting tools, crafts, archaeological pieces and clothing, especially related to the Lacandon Jungle and Indigenous peoples. 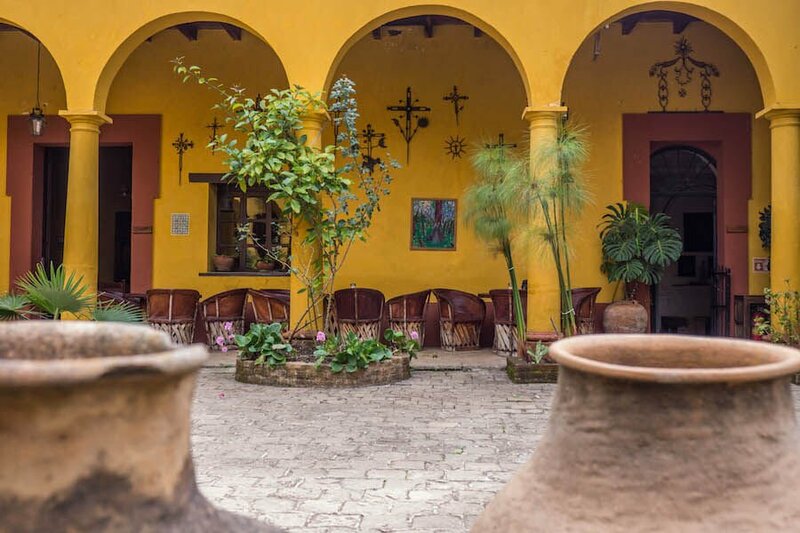 Although not one of the essential things to do in San Cristobal de las Casas, if you can only go to one museum here, this is the one you should visit. Entry is $40 pesos ($2.10) and the museum is a short walk from the historical centre. This beautiful day trip is another one of my top things to do in San Cristobal de las Casas. 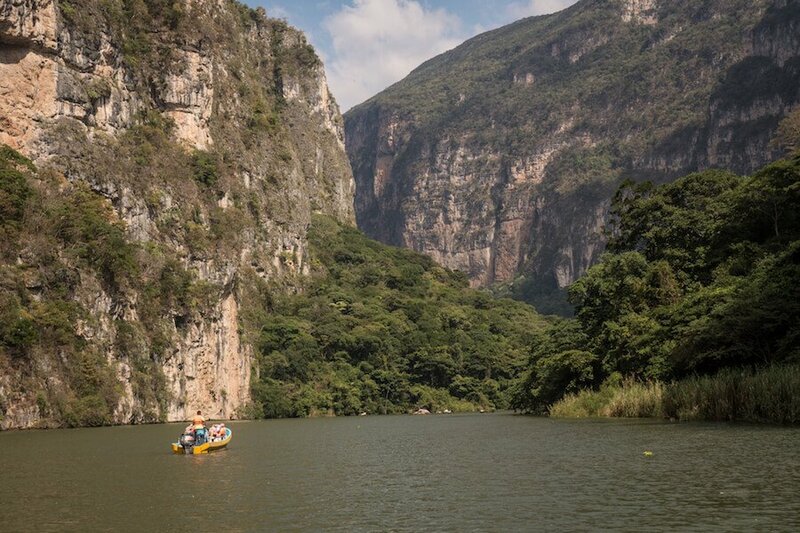 Canyon de Sumidero is well-known for having an abundance of wildlife such as crocodiles, monkeys and birds. As you boat down the narrow passage with high canyon walls, you can’t help being blown-away as you drink it all in. Tours to Canyon de Sumidero can be taken from San Cristobal daily. Alternatively, and if you have your own transport, there are several viewpoints along the canyon walls where the river Rio Grijalva below can be viewed from. If you love being immersed in nature I recommend this tour as one of the best things to do in San Cristobal de las Casas. Click here to learn more and book the tour with Get Your Guide. This market is the beating heart of San Cristobal and the Indigenous textile-makers and artists are one of the huge reasons this city is so popular with tourists today. 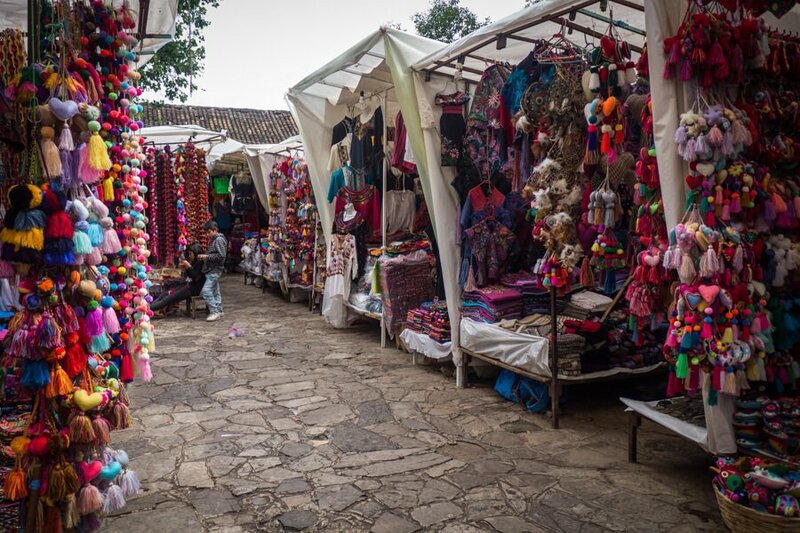 Filled to the brim with vibrant colourful handicrafts, bags, clothes, blankets, jewellery and trinkets, this market is the best way to pass a few hours in San Cristobal. There are numerous things for sale, including amber – a gem that is highly valued by the Ancient Tzotzil people, and is also very cheap. If you haven’t already visited the Artisan Market on the Free Walking Tour, then this needs to go on your ‘things to do in San Cristobal de las Casas’ list! The hustle and bustle of this food and electronics market will certainly get your heart rate up! The tightly packed area with people rushing around may appear messy and disorganized, when in fact the Municipal Market is actually a well-functioning organism. 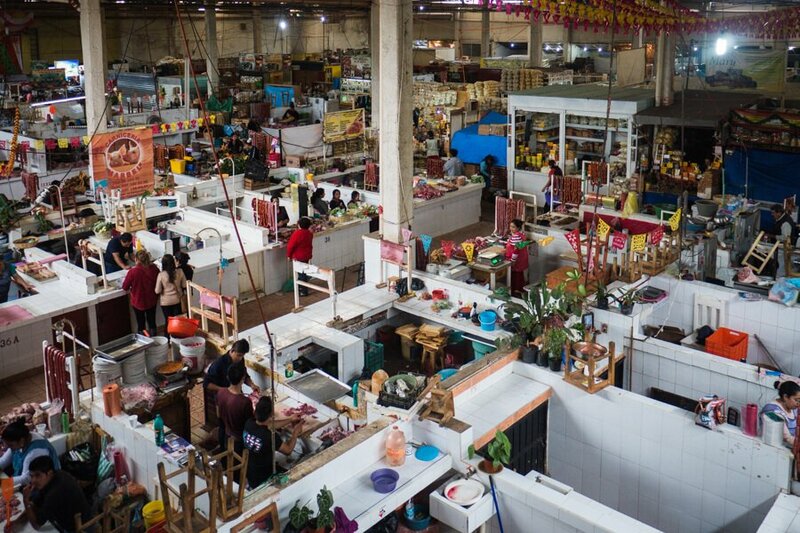 A visit to the local market is definitely one of the top things to do in Mexico City as well. The Municipal Market is located just around the corner from the Artisan Markets so be sure to visit both at the same time. If you are on the fence about going, the Municipal Market is one of the essential cultural things to do in San Cristobal de las Casas and it’s interesting to immerse yourself in the village way of life. Words of warning: keep your camera to one side and always ask the local people before taking a photo of them or their products. They are there to do business and don’t always like having their picture taken. Jade is another precious stone that was very important to the Ancient Indigenous peoples of Chiapas. At the Jade Museum, you can find replicas of the jade masks discovered in the Pacal Tomb of Palenque Ruins. If you have already visited, or plan to visit, Palenque then make sure to check these masks out! It’s very interesting to see how the Mayans worked the jade (which is harder than steel) in ancient times. The Jade Museum is an activity in San Cristobal de las Casas that you could miss if you don’t have the time. But it is so close to the central Zocalo and such a small place that it only needs about 30 minutes to complete and is worth doing so if you are already in the area. Entry fee is about 35 pesos ($1.85). A hidden gem on the outskirts of San Cristobal, the El Arcotete Park is a well-maintained walk consisting of tracks alongside the river, a photogenic natural limestone arch and some caves with natural windows that look out over the river. It is about a 30-minute walk from Iglesia de Guadalupe through local housing and farmland. Entrance to the park is $10 pesos ($0.53) and another $10 pesos will get you inside the caves. There is also a series of zip lines that can be taken for about $100 pesos ($5.30). The El Arcotete Park is more popular with travelling Mexicans than it is with backpackers. For this reason, it gets quite busy on weekends, so to avoid the crowds, visit during the week. Be sure to exit the caves before 5 pm otherwise there’s a chance you could be locked in when they close! This quaint little building which hosts the Kakaw Museum is the perfect place to relax after a long day of sightseeing. Kakow is an important aspect of ancient Mayan culture and farmers in San Cristobal grow cocoa organically. The leafy chocolate-smelling café is downstairs while the museum is upstairs. The museum delves extensively into how kakaw was used by Mayan people in ceremonies and as currency. This museum is both cheap ($30 pesos – $1.60) and interesting, and is located in the centre close to the Zocalo so consider dropping in if you find yourself wandering past. 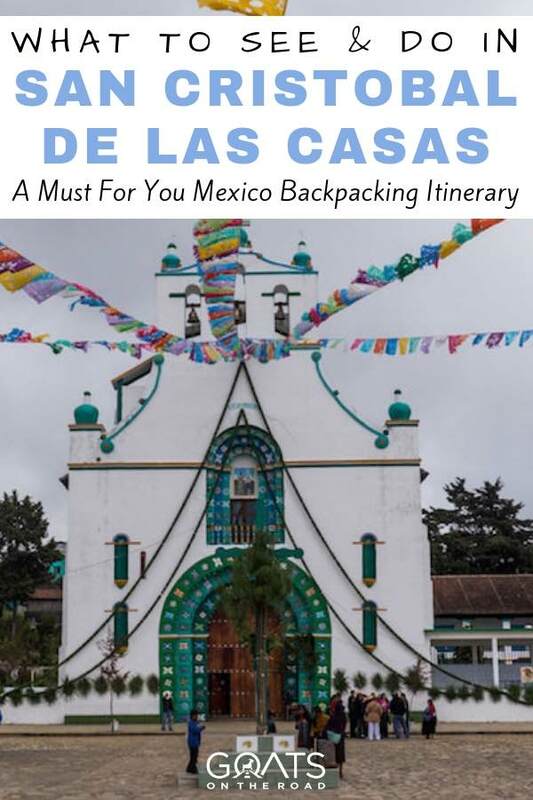 Pack your bags for San Cristobal de las Casas! San Cristobal de las Casas is a fantastic place to visit in Chiapas, with art and culture being the centre of the cities’ vibrancy. It feels like a completely different side to Mexico that the beach-goers and vacationers sometimes miss. 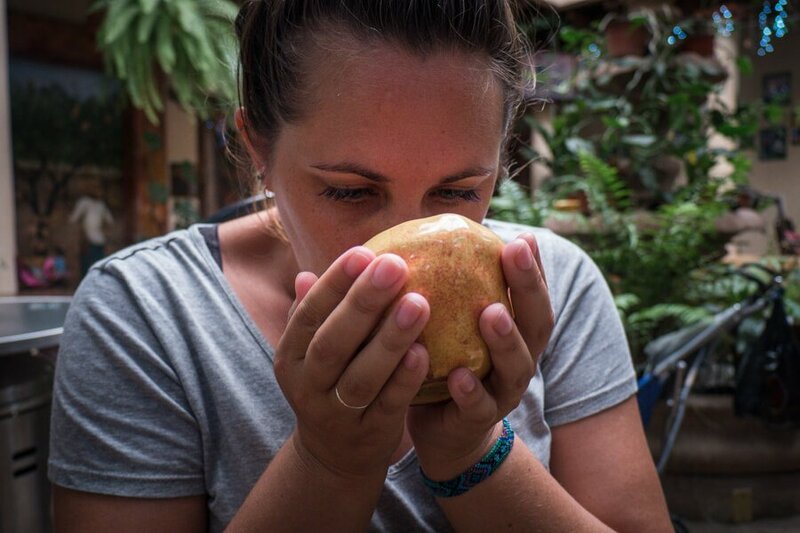 Immersing yourself in the mind-blowing Tzotzil and Tzeltal cultures cannot be experienced anywhere else in Mexico. It is honestly one of the best things to do in San Cristobal de las Casas. Be sure to bring a little extra money to buy some of this amazing hand-made art or amber jewellery to remember your incredible time in San Cristobal. Passionate baby goat cuddler and part-time adventurer, Crystal can often be found doing headstands on the edges of cliffs, taking photos of abandoned buildings or sleeping on deserted islands with dangerous criminals. 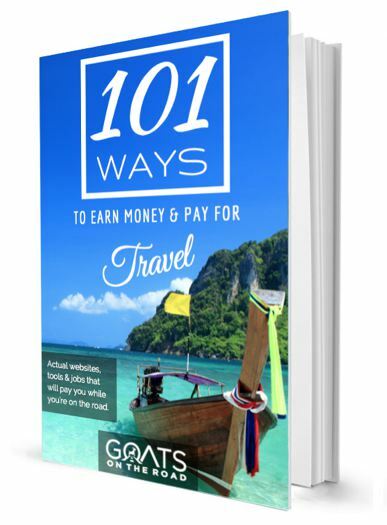 She has too many awesome stories and helpful tips to keep them all to herself so follow along with her blog Castaway with Crystal, and in return, she will bring you inspiring pictures, travel videos and a whole load of fun! This trip looks so epic! Such a beautiful part of the world, and I can imagine how incredible it. 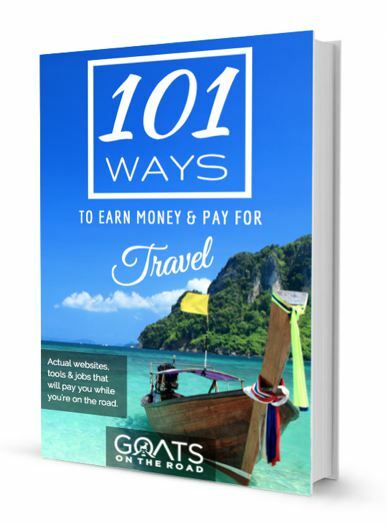 Lovely to see this story of your travel.. Thank you so much for sharing a great experiences and post.